Make a delicious sugar cookie pizza with this simple recipe, easy enough for kids to help. Perfect for the Fourth of July or Memorial Day. Don’t forget to scroll down to the end of the post to see a video of how it’s done! I’m a huge fan of cookie pizza. In fact – if I can have a dessert pizza for my birthday instead of a cake, that’s what I’m going to pick. 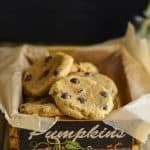 I especially love to make cookie pizza around holidays because it’s so easy . 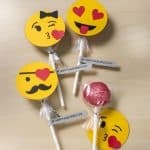 . . and you can really customize them any way you like. 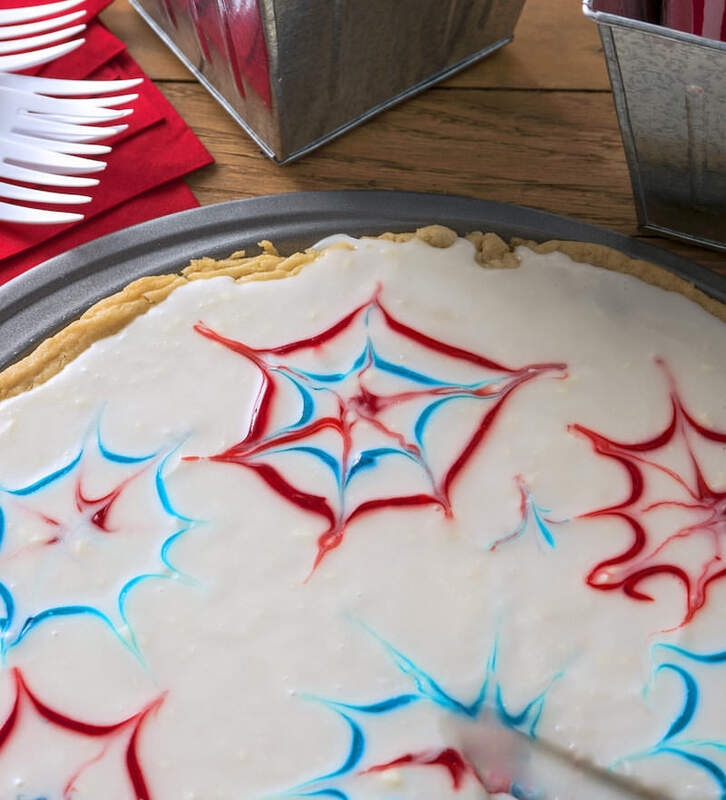 I had a great time decorating this Halloween cookie pizza , so I decided to use a similar technique and different colors to make one for the Fourth of July. Nothing says Fourth of July more to me than fireworks, though I feel horribly sorry for my dog Yoshi because she can’t stand them. 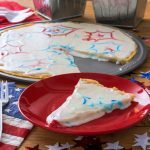 There’s another fun way to celebrate summer holidays with fireworks, except this one is edible: a yummy fireworks cookie pizza. The only danger with these fireworks is that you’ll have too much fun making (and eating) the pizza! 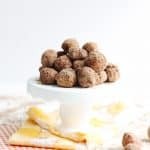 This is a fun and easy activity for the kids, and grown-ups can participate (especially with the baking part). Children will love customizing their own cookie pizza with the colors of their choice. It’s a simple and unique way to create your own fireworks while enjoying a tasty treat. Heat over to 350 degrees. Use a nonstick pizza pan, or spray your pizza pan with nonstick cooking spray. Open the sugar cookie dough, place it in the pizza pan, and start spreading with your hands. You want to spread the dough out into a circle that fits inside the pan. You can smooth it out and patch the areas that you need to with dough – the dough is going to even out when you bake. 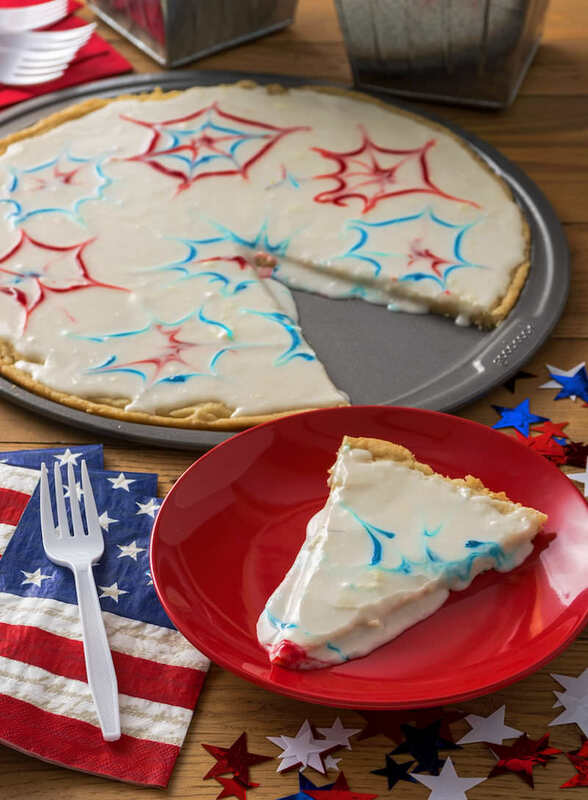 Bake your dessert pizza according to the sugar cookie package instructions – approximately 12 – 14 minutes or until the edges are brown. Let cool for at least 20 minutes. While the cookie pizza is cooling, make the vanilla frosting. 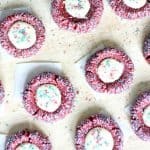 This is one of my favorite frosting recipes, and I use it not only for cookie pizza, but for just about everything. The steps are really simple. Place 2 cups of confectioners’ sugar in a bowl. Add 2 tablespoons butter, 2 tablespoons milk, and ½ teaspoon vanilla extract to the sugar. Stir to combine. The mixture should be frosting consistency; if it isn’t, add a touch of milk and keep stirring until it reaches desired consistency. Use a knife to spread the frosting out onto the cookie, completely covering the cookie top. Make sure your gels are ready, because you’ll going to let the kids immediately start making their fireworks before the frosting hardens. They’ll put dots down and then add circles around the dots. Let them drag outward from the center to create the fireworks pattern! Make a delicious sugar cookie pizza with this simple recipe, easy enough for kids to help! Perfect for the Fourth of July or Memorial Day. Bake according to the package instructions – approximately 12 – 14 minutes or until the edges are brown. Let cool for at least 20 minutes. Use a knife to spread the frosting out onto the cookie, completely covering the cookie top. They’ll put dots down and then add circles around the dots. Place gel dots down immediately, and add circles around the dots. Using a toothpick, drag outward from the center to create the fireworks pattern. Place 2 cups of confectioners’ sugar in a bowl. Add 2 tablespoons butter, 2 tablespoons milk, and ½ teaspoon vanilla extract to the sugar. Stir to combine. 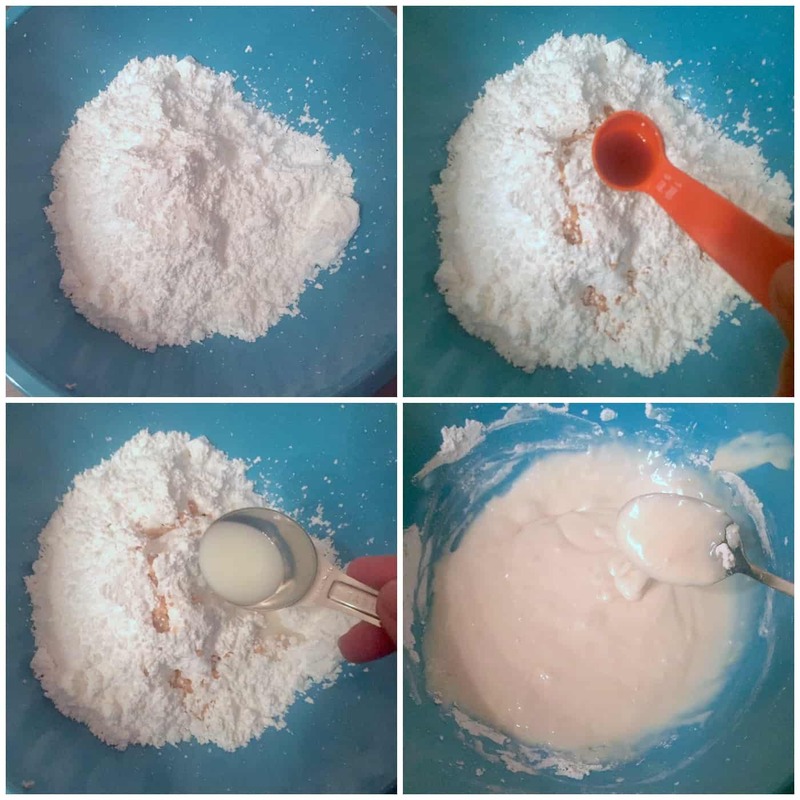 The mixture should be frosting consistency; if it isn’t, add a touch of milk and keep stirring until it reaches desired consistency. 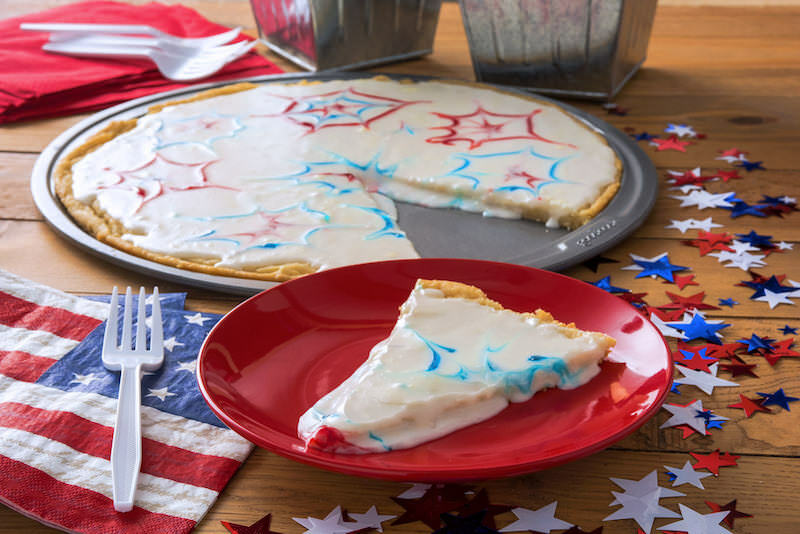 Use a pizza cutter and a spatula to cut and serve your Fourth of July dessert pizza. Everyone is going to love it – I promise.